Meso Scale Discovery immunoassay kits provide highly sensitive, precise, and accurate results across a wide dynamic range with fast, efficient processing. Our assays perform equally well alone or combined with compatible assays into multiplex panels designed to address specific research questions. 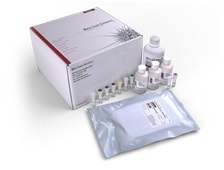 V PLEX validated kits meet the highest standards for research assays. V-PLEX validated assays deliver reproducibility and reliability to support the most demanding long-term studies. V-PLEX assays maximize consistency in results and confidence in data. Developed under design control and according to the FDA’s analytical validation guidelines, V-PLEX represents the highest quality assay available from MSD. Comprehensive testing of all raw materials and kit components combined with rigorous manufacturing and QC specifications ensure reproducible results time after time. Offering exceptional dynamic range, high sensitivity, accurate results, and lot-to-lot consistency, V-PLEX kits are available as individual analyte kits, preconfigured multiplex panels, and custom multiplex panels. Build your V-PLEX assay using our Assay Designer. Choose from an extensive analyte menu and customize your assay to your exact specifications. MSD’s validated assay kits meet the Clinical Laboratory Standards Institute guidelines for consistency, sensitivity, precision, and robustness. Validation testing is conducted through a design-control process according to the principles outlined in “Fit-for-Purpose Method Development and Validation for Successful Biomarker Measurement” by Lee, J.W. et al. Combining our assays into efficient multiplexes can save both time and money. If we don’t already offer a panel that works for your application, we will help you design one. Customized V-PLEX Panels: MSD’s preconfigured V-PLEX panels can be customized to include only the validated assays needed for your particular research project. It is as easy as clicking the assays you want when you purchase your V-PLEX kit. Custom V-PLEX orders typically ship in 1 to 3 days. Customized Standard Panels: MSD’s standard panels can also be customized. Our Scientific Support team can advise you on analytical compatibility and will help you design a panel that most efficiently provides the measurements you need. Customized standard panels generally ship within 3 weeks. Special Order Kits: Special order kits allow customers to combine V-PLEX assays in new configurations or mix V-PLEX assays with selected assays from MSD’s standard menu .